SKU: A33845 Categories: NEW ARRIVALS, Halloween, White, Shaped Foil Balloons, Emoji, Spooky Halloween, ON SALE! The Ghost Face Emoji Foil Balloon by North Star Balloons is a fun option for Halloween! 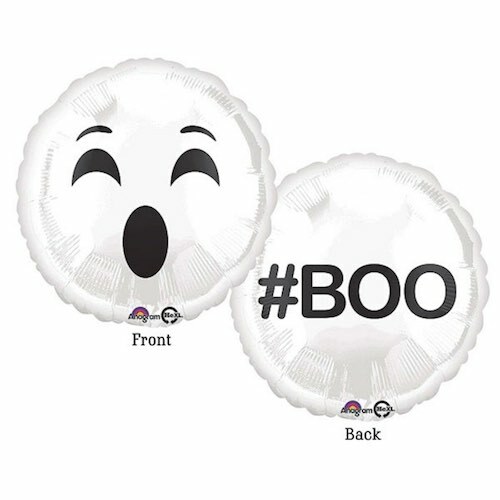 It is a white foil balloon with a ghost face on one side and #BOO on the other. Team up with black and white marble balloons for a monochromatic style. This foil balloon can be inflated using helium or air. NOTE: The Anagram branding shown in the image is not on the balloon.